Alan Ernest Bidstrup was born in Melbourne on the 8th of October, 1925. He was the second son of Ernest Oliver and Lizzie Marie Bidstrup. His first school was Kur Kurruc State School, Sugarloaf Creek, Broadford, which was 400 metres from his family home, “Annadale.” The teacher boarded with his parents. In 1938, he joined his brother George at The Geelong College, where the annual fee for boarding and tuition was 150 pounds [($300) = $5000 in 2016 dollars]. The following year he was awarded a scholarship, which paid half the fees for the next two years. At the age of 15, after completing the equivalent of Year 10, he returned to the farm where he worked until retiring at 83yrs of age. On returning, he joined the Air Training Corps but was “man-powered” back to the farm when he became 18. Petrol rationing during the war limited the family car and the shearing plant to 13 gallons per month, so many trips were made by bicycle, horse and jinker. Entertainment consisted of football, dances, balls or gymkhanas. 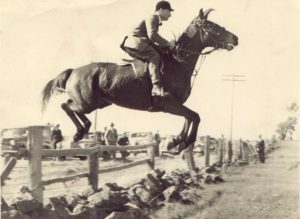 Together with his brother George, he successfully competed in riding competitions in both the Royal Melbourne and local Shows. His very good eventing pony, Tocum, gave him a lot of pleasure. He was a member of the Findon Hunt Club. Another past- time was his involvement in the Seymour Young Farmers club where he was President in 1947. He was also a member of Seymour Presbyterian Fellowship Association. A highlight of his year would be accompanying his uncle J.F. '(Fin) McNab, a noted Merino Sheep Stud Classer, to various flocks in his circuit covering Victoria, the Riverina and South Australia. In April 1945, his brother George was reported missing. He was flying on an exercise out of Williamtown a RAAF Mosquito Aircraft. The wrecked plane was found 9 months later, by Les Collison, a local grazier, on the Barrington Tops of NSW. 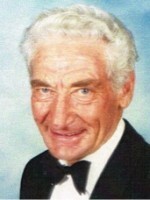 Les went on to be a great family friend for over fifty years. Alan and his father visited the site on horseback, as did Esmé some years later. Alan and his father Ernie attended the funeral at Sandgate War Cemetery near Newcastle. Alan became engaged to Esmé Hayes in February 1950. two weeks before she sailed to Europe to backpack for the rest of the year, which also included travel around the UK. Esme’s original plan was to be away for two years, and to teach for twelve months in England. Plans changed! They were married in December 1951 and lived at “Annadale”, where Alan’s father was born in 1886. He and his father farmed in partnership until his father’s death in 1985. He and his father had a wonderful relationship, and never had a cross word between them. The first of four sons, George, was born in 1956, the second Ian in 1957, the third David in 1959 and the fourth Roger in 1963. In 1969, after moving into their new homestead at “Annadale”, he was successful in winning the Hanslow Cup for Soil Conservation and later the Royal Melbourne Show Victorian Farm Management, Production and Improvement Competition. With improved farming practices, and hard work, “Annadale’s” wool production was increased from 60 bales per annum to in excess of 300 bales. Over the years the land holdings at “Annadale” were expanded, as well as buying a property in the Western District. This farm was later sold, and after George and Anna were married, a property named “Bornholm” was purchased at Culcairn NSW in 1978. Bidstrup Pastoral Company was formed with Alan, George and David farming together. At all times Alan was community minded, being a member, Lieutenant and Captain of Glenaroua Fire Brigade over a period of more than 70 years. At 20 years of age he became a member of the Seymour Agricultural Society, which continued until his death. He served as President, an appointment which included being the first President of the Victorian Wines Show. He was a committee member and volunteer of the Broadford Cemetery Trust for 44 years. He spent 10 years as a member of the Seymour Rotary Club, being the President in 1996-1997. He remained connected to the club, which gave him great pleasure. The Broadford Masonic Lodge was an important part of his life, beginning in 1948, where he was the organist for many years, as well as holding various offices including that of Lodge Master. He received his 65-year Masonic Jewel in 2014. Alan was a devoted and loving brother of George (Dec.) and Nancy. He was a very proud and supportive father of his sons and their partners. Namely; George and Anna, Ian and Judy, David and Judy and Roger. Papa cherished his Grandchildren and Grandchildren in law; Robert and Jodie, Samantha and Anthony, Rebecca and Vinnie, Tom and Rachael. Max, Laura, Luke and Courtney, Peter, Alex and Hugh. Grandpapa adored his Great Grandchildren; Madison and Brayden. Maya and Emma. Sadly, on the 16th of April 2009. he lost his youngest son, Roger. He and Esmé did a great deal to bind together the broader family including members from W.A, S.A, Vic, and Qld. He had a special connection with the Queensland Bidstrups, especially his cousin Clive. He also had a very special relationship with Esme’s twin brothers, Gilbert and Bruce. They were like brothers to him. Along with Esmé, he greatly enjoyed travel to the U.S.A., Europe, Egypt, Singapore, Thailand, Vietnam, Cambodia, New Zealand, the Caribbean and Uzbekistan. Of particular interest to him was a visit to his Bidstrup ancestral home on the Danish Island of Bomholm, in the Baltic Sea. He also visited the birth place of his Great Grandfather Michael Zwar, near Dresden in Germany. He, however, did not neglect Australia, travelling extensively by car and light plane. Many a neighbour would testify to his willing response whenever they were in need of help. This often resulted in strong friendships to be formed, and help when he needed it, especially as he got older. Alan liked to meet and talk to people of all ages and backgrounds, and was genuinely interested in their lives and families. He was a “people person” who touched many people’s lives both here and around the world.